If you need drought resistant plants and flowers, don't despair. There are plenty of beautiful flowering plants that have low water requirements, making them perfect for drought-prone areas. Best of all, many of these plants are also very easy-going about their soil requirements. They'll put up with the worst soil imaginable and smile through their sepals. Homeowners living in drought-prone areas must choose plants and flowers that can live without water for weeks, if not months at a time. If you rely upon rainwater to water the garden, drought-resistant plants and flowers are also a good choice, since the vagaries of Mother Nature may result in many weeks without rain, depending upon the year. Drough resistant plants make sense from an eco-friendly standpoint too, since you don't have to use valuable natural resources to have a lush, beautiful garden. These flowers combine into delightful gardens. Choose zinnias, lantana and sweet alyssum for a drought-resistant combination that attracts butterflies. 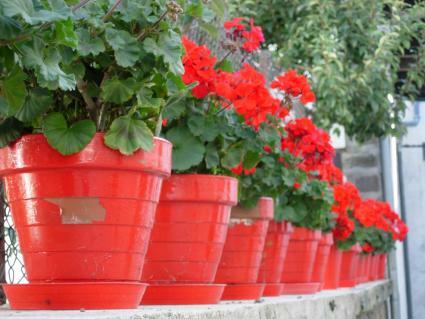 Pair geraniums with verbena in a window box or container and you'll have to water less frequently than with other plants. Many perennials show high tolerance for drought. Perennials return year after year, and many spread out in clumps or clusters. They're ideal for hot, sunny slopes which get little water. There are many more perennials suited to dry, hot conditions. Among the list above the noteworthy addition is hosta. Hosta makes a great flowering perennial for shady areas, and although the flowers aren't huge, they do add a vibrant burst of white, lilac or purple above the different green shades of foliage. Hens and chicks make a great rock garden plant. If you're adding perennials to the butterfly garden, choose Penstemon, Ascelpias and yarrow. Many trees and shrubs do just fine in drought-prone areas. These include Acuba, Beautybery, Crape Myrtle, live oaks and many, many more. Most perennial grasses tolerate drought well, as do succulents such as cacti. Choosing drought tolerant plants differs among the various gardening zones. Know your zone first, then look for lists of drought tolerant plants close to or in your gardening zone. Your local County Cooperative Extension office probably has a list of drought tolerant plants suitable for your particular location. Begin your search there, and then try some of the following resources. Remember to search for information for your specific state, too. After choosing drought resistant plants and flowers, think about other aspects of the landscape that can enhance water retention for plants. Various mulches, for instance, help reduce evaporation and thus retain even dew and brief showers that water the plants. Think about adding a thick layer around plants, particularly new plants, until they're acclimated. Consider a completely drought tolerant section of the garden, such as a succulent or cactus garden. Using large rocks and decorative stones, you can create a unique desert vista even if you live in a temperate state. Another idea is to group plants according to a theme, such as butterfly gardening plants. If your area is prone to droughts but you love water-hogging plants such as impatiens and roses, why not try growing them in containers? Containers must be watered daily, but a small container on the deck may satisfy your love for a particular plant without drinking you out of house and home.